Breakfast: Scrambled Egg Bowls are one of my favorite post-op breakfasts. In fact, I've been known to have them for dinner too. 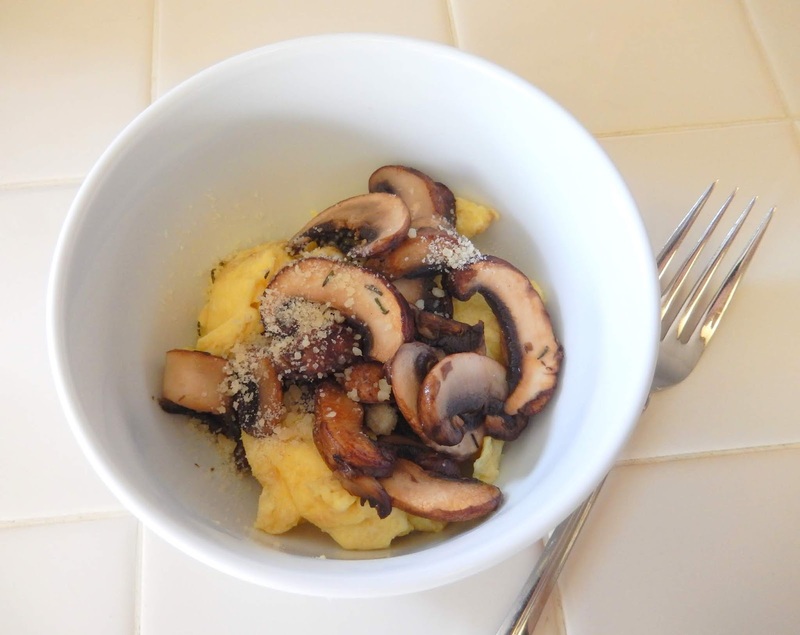 This one is probably the one I have the most because I hate wasting mushrooms so if I have a few bumping around I sautee them with a pinch of fresh thyme and serve them over a scrambled egg with a sprinkle of Parmesan cheese. After breakfast, I head to the Farmer's Market. Today was the first day I felt human after a 3-day migraine. My fellow sufferers can relate I'm sure... that foggy, can't move too quickly because you are afraid it will come raging back feeling but also really wanting to do something to get back into the human race. I didn't stay long but I bought some beautiful zucchini, eggplant, peppers and onions that will all turn into delicious parts of this week's menus and some berries for breakfast or toss in a protein shake. 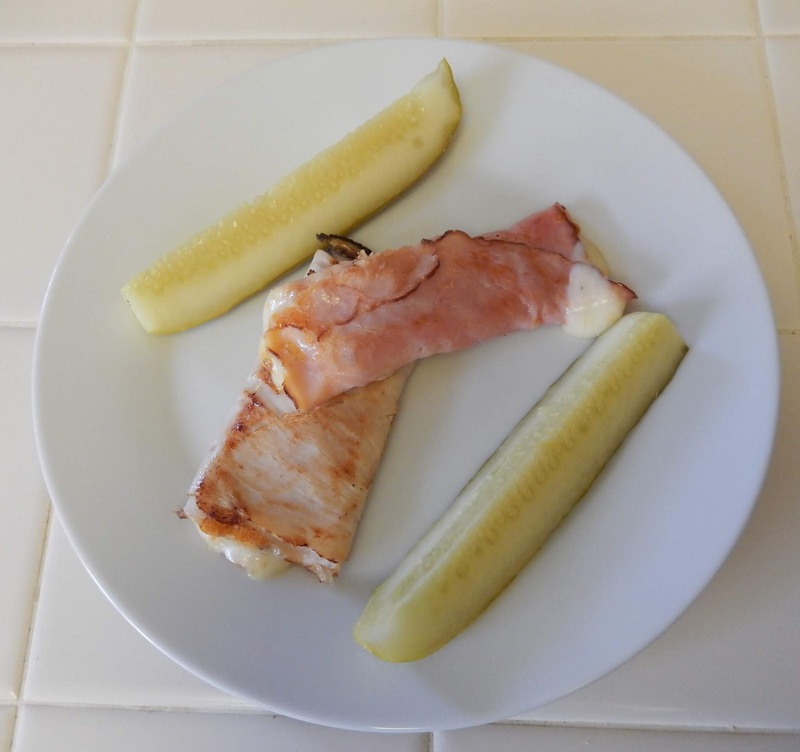 Lunch: Melted Ham and Cheese Roll-ups and Pickles, an easy, go-to, are cold-cut roll-ups (look for low sodium, free from nitrates/nitrites options) sometimes I just roll them up and call it a meal or when I'm feeling like a grilled cheese (I don't do bread) a quick saute in a pan gives me the melty, cheesy, gooey, I'm wanting. 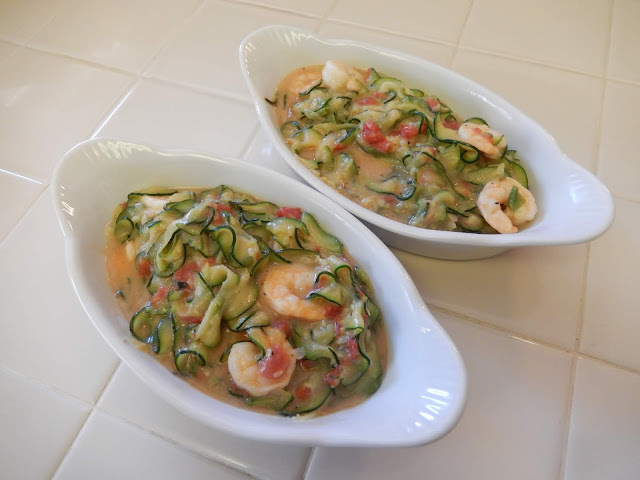 Dinner: I felt up to a little cooking and made Shrimp and Zucchini Noodles with a storebought Bruschetta sauce... this one is so easy and literally takes less than 20 minutes from start to finish. Less if you used a pre-cooked protein... like leftover chopped, grilled chicken or steak instead of shrimp which I sometimes do. Spiralize the zucchini and saute till just tender about 5 minutes. Drain most of the excess liquid. I prefer a lot of sauce so I drain most but not all. If you like a less soupy end product drain it all. Add garlic and cook for a minute. Add Bruschetta sauce and shrimp. Cover and cook till shrimp are opaque and cooked about 8 minutes. Salt and pepper to taste. Mix all ingredients together about 15 minutes before serving. Snacks: I had a Starbucks Sugar Free Vanilla Soy Latte as I walked around the Farmer's Market and in the evening a piece of Coconut Cream Protein Pie sitting outside getting some fresh air. After being curled up in a dark, room it was nice to breathe some fresh air and look at the stars. 2 cups of Sugar-Free Pudding (I used 1 small package Sugar-Free Vanilla Pudding and milk, prepared per package direction) When pudding has thickened, mix in 1/4 cup Unsweetened Coconut, toasted. You'll need a little more for the top. Optional Protein Pudding: 1/4 cup Protein Powder (any flavor, mix into the milk and pudding mix to dissolve) When pudding has thickened, mix in the 1/4 cup Unsweetened Coconut, toasted OR another option: 1 small package Sugar-Free Vanilla Pudding and instead of the milk and added protein powder in the pudding recipe you can use Vanilla Ready to Drink Protein Shake (Premier, Unjury, etc.) When pudding has thickened, mix in the 1/4 cup Unsweetened Coconut, toasted. You'll need a little more for the top. 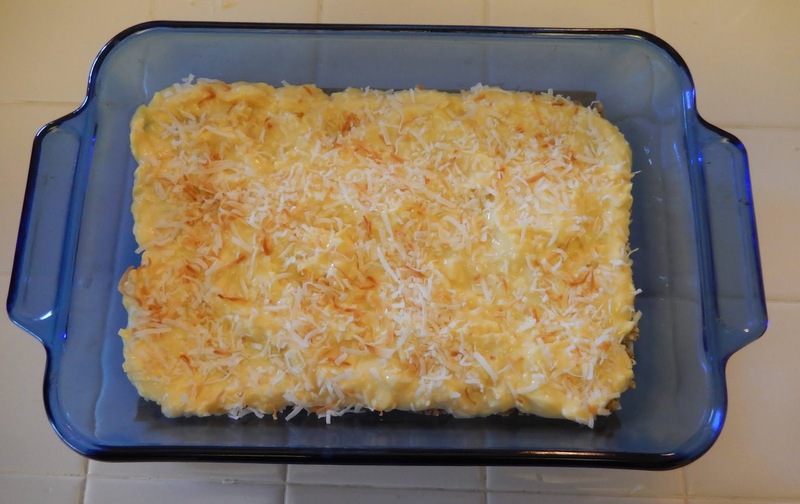 Mix crust ingredients together and press into 11x8 Pyrex rectangle casserole dish or pie plate that has been sprayed well with non-stick spray. Bake at 350 for 13 minutes. Allow to cool completely. Spread pudding over cooled crust. 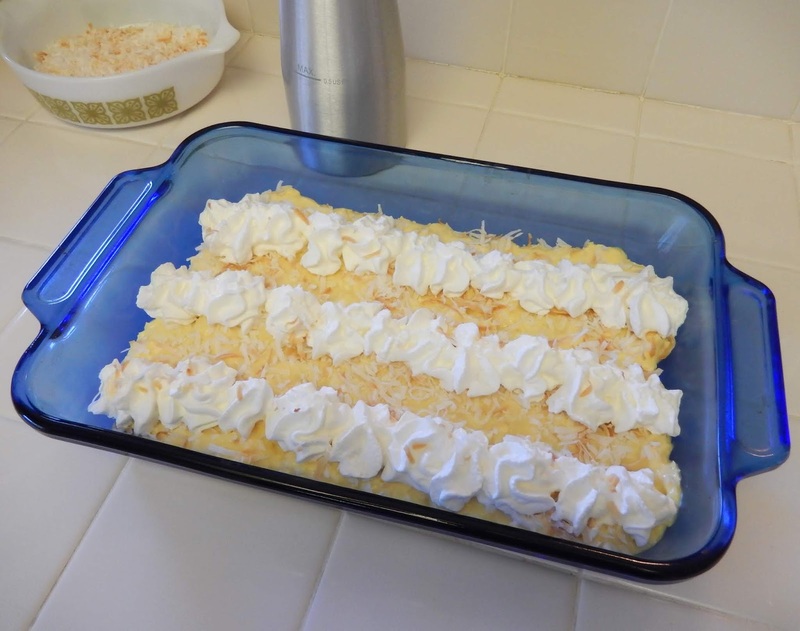 I like to have some additional toasted coconut on top of the pudding layer but can be omitted. I think it makes it pretty. Return to the fridge for at least an hour. Serve portions with a squirt of No Sugar Added, Homemade Whipped Cream. You can even make that coconut flavored. 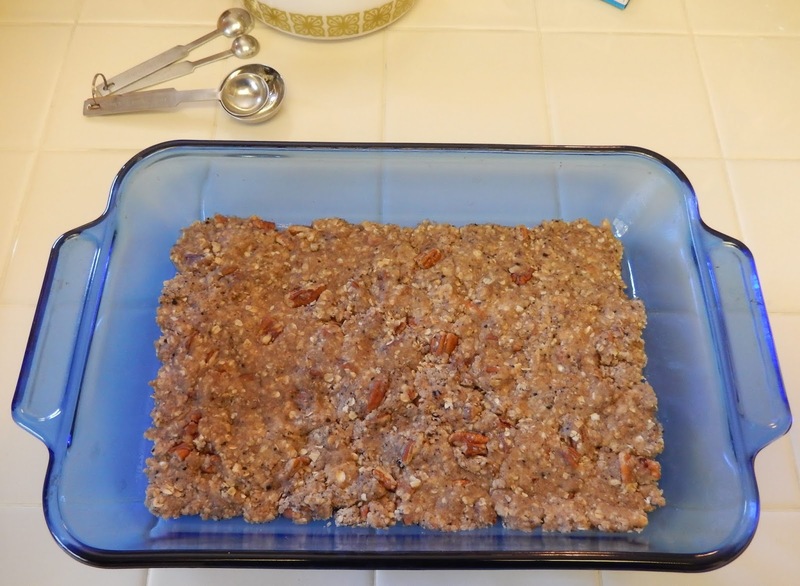 Makes around 15 servings. Holds up several days in the fridge, I actually made this before my migraine and the crust was still yummy and crunchy. Thankful I am on the other side of this migraine. I need to go back to the doctor and see what is new and exciting in the way of treatments. Open to hearing from others about what is working for them.